In an acute resuscitation situation, after the airway is secured and adequate breathing and gas exchange are established, the next priority is to obtain vascular access. This is often difficult in infants and children. The physiologic processes of shock and hypothermia with resulting vascular constriction, which are often present in a resuscitative situation, may further complicate the problem; furthermore, the skill and experience levels of providers in caring for small children widely vary. Intraosseous (IO) access has been used therapeutically since 1934 and has been proved to be a safe, reliable, and rapid means of introducing crystalloids, colloids, medications, and blood products into the systemic circulation. [1, 2, 3, 4, 5, 6, 7, 8, 9] The marrow cavity provides access to a noncollapsible venous plexus as blood flows from the medullary venous sinusoids into the central venous sinus and is then drained into the central venous circulation via nutrient and emissary veins. With the development of the intravenous (IV) catheter, the IO needle fell into disuse. In the 1980s, however, IO access was rediscovered as an immediately available tool in resuscitation situations, when time is of the essence and conditions may be adverse. [10, 11] Since then, IO access has become widely accepted in pediatric settings, especially because these patients often provide a particular challenge to obtaining rapid intravascular access. Initiation of IO access is indicated in adults, children, infants, or newborns in any clinical situation where vascular access is emergently needed but not immediately available via a peripheral vein. IO access provides a means of administering medications, glucose, and fluids, as well as (potentially) a means of obtaining blood samples. Such a situation would include any resuscitation; cardiopulmonary arrest; shock, regardless of etiology; life-threatening status epilepticus; or lack of venous access resulting from burns, edema, or obesity. IO needle placement does not constitute definitive therapy; rather, it allows the administration of life-saving medications and fluids in a context where intravascular access is vital. Often, definitive IV access is easier to obtain once a bolus of fluids and medications has been administered via the IO needle. 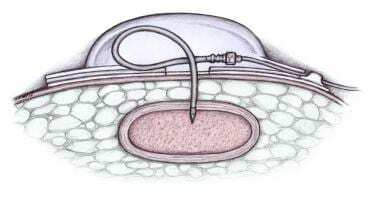 IO needles may be left in place in the marrow for up to 72-96 hours; presumably, the longer the needle remains in place, the greater the risk of infection and dislodgment. In practice, the needle is usually removed as soon as another means of vascular access (either peripheral or central) is available, ideally within 6-12 hours. Intraosseous (IO) access was initially thought to be less applicable in patients older than 6 years. However, historical and current data (eg, in military populations  ), as well as guidelines from the American Heart Association  and the American College of Critical Care Medicine, [16, 17] support the consideration of IO techniques in patients of any age as rapid and equally effective alternatives to intravenous (IV) peripheral lines. The particular site used (see Technique) varies as appropriate for the age of the patient, the anatomic landmarks present, and the bone density. It should be noted that the blood chemistry, drug levels, hemoglobin concentrations, blood typing, and acid-base status  of the blood in the marrow aspirates obtained from the IO needle have been found to be reliable predictors of the corresponding serum values (although this may not be true of blood chemistry and acid-base status in the setting of prolonged resuscitation). Clearly, the use of IO access in a battlefield setting remains applicable; this venous route continues to be accessible even in the most hypovolemic patient, and military and trauma literature attest to its usefulness in that setting. The optimal duration of IO access is still the subject of controversy. On an intuitive basis, it would seem that long-term use of IO access should increase the risk of potential infection, but the infection and complication rates are actually very low, even in the most exigent circumstances. No data support the common informal recommendation that another access avenue must be obtained before transfer from the emergency department or that the IO needle should be removed as soon as possible. Several needle types are available (see the images below). The traditional needles are inserted manually, but powered needle insertion devices are becoming more popular. 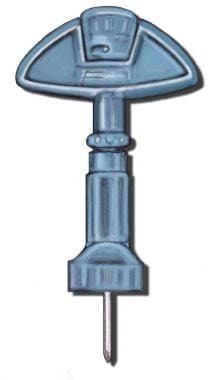 Cook-type screw-tip intraosseous needle (Sur-Fast needle). Illinois sternal iliac intraosseous needle. 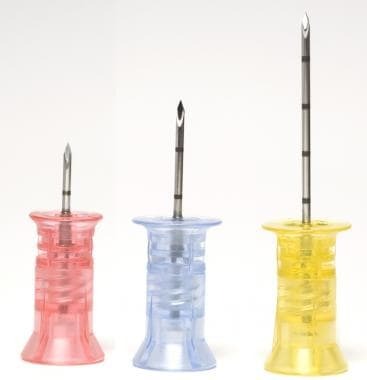 Shown are 3 different sizes of intraosseous needles for use in EZ IO (Vidacare). Appropriate size is determined by patient weight and size. 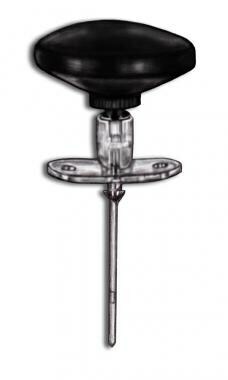 Bone Injection Gun (BIG) spring-loaded intraosseous insertion device (Waismed). Sternal needle: F.A.S.T.1 system (Pyng Medical Corporation). With the exception of neonatal settings or neonatal intensive care unit (NICU) settings, in which spinal needles are occasionally used, the intraosseous (IO) needle should have a needle stylet to reduce the likelihood of bony spicules or a clot clogging the needle. In addition, the IO needle should have some means for the operator to gauge the distance to which the needle has penetrated, either with markings on the shaft or a covering flange that prevents insertion deeper than a predetermined distance. 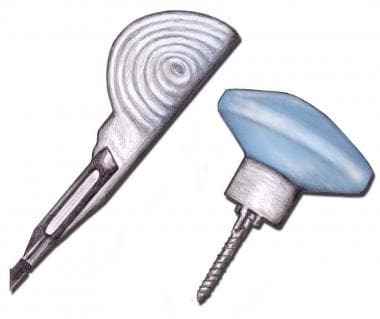 Once the bony cortex has been penetrated, the needle usually need not be advanced more than 1 cm to provide stability and access to the marrow cavity. The various types of IO needles currently available in pediatric emergency department (ED) and hospital settings are placed by means of different insertion methods. The traditional needles (Cook, Jamshidi) are placed manually; the site, force required, and depth of insertion are determined by the operator. However, powered insertion devices are used with increasing frequency in pediatric patients in US hospitals—in emergency departments (EDs), critical care units (CCUs), and even operating rooms (ORs). Since 2006, 2 devices have been approved by the US Food and Drug Administration (FDA) for use in adult and pediatric patients: the Bone Injection Gun (BIG) device (Waismed) and the EZ IO (Vidacare). The BIG device, which is more widely used outside of the United States, has a spring-loaded handle that injects the IO needle to a preset depth, determined by the patient's age. In the United States, the EZ IO is now widely used in field and transport settings (eg, emergency medical service situations). 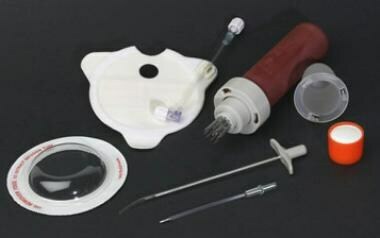 It has a battery-powered drill handle that powers the needle insertion; the length of the needle is determined by the patient's weight in kilograms, and the depth of insertion is determined by the operator (as with the manual devices). Neither device requires special removal equipment. Training videos are available on the respective Web sites (Vidacare and Waismed). The F.A.S.T.1 system (Pyng Medical Corporation) for sternal IO needle placement in adults includes both a marker patch and a special introducer device to simplify needle placement and the depth of needle insertion. In addition, this system uses a flexible infusion tube rather than a rigid stylet after needle removal to minimize displacement. It requires the use of a removal device, which is included with the kit. The insertion site of choice in children and infants is the proximal tibia; the distal tibia and distal femur are alternatives (see the images below). The proximal tibia provides a flat wide surface and has only a thin layer of overlying tissue, which allows easy identification of landmarks. Additionally, the proximal tibia is distant from the airway and chest, where cardiopulmonary resuscitation (CPR) is often in progress. Intraosseous needle insertion sites in infant or small child. Proximal tibia intraosseous needle insertion site. The anterolateral proximal humerus is another site that is often used in adults. As powered devices become more widely available and IO access becomes more commonly used in the prehospital setting and in adults, this site will become increasingly relevant. With increasing age, the cortical thickness of long bones, particularly the tibia, increases, making penetration more difficult and forceful; thus, in older children and adults, using the distal tibia or the proximal humerus may be advantageous because it also provides reliable and evident landmarks, has a relatively thin cortex, and is distant from ongoing CPR (see the images below). Intraosseous needle insertion sites in older child, adolescent, or adult. Distal tibia intraosseous needle insertion site. The distal femur (see the image below) may also be used for IO access, but it generally has much denser covering layers of fat, muscle, and soft tissue, which make identification of landmarks and bony penetration more difficult. 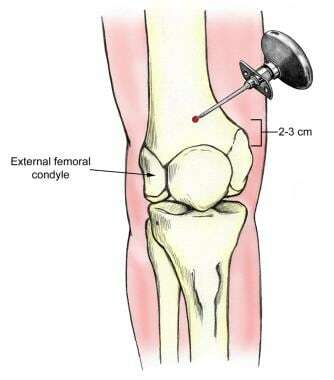 Distal femur intraosseous needle insertion site. 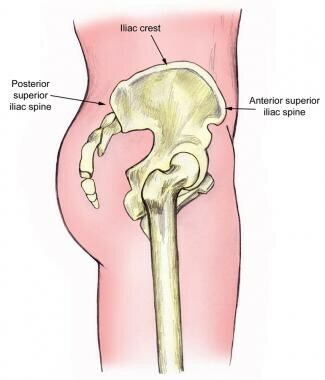 In adults, other insertion sites have included several different iliac sites (see the image below), the sternum, the distal radius or ulna, and, as mentioned above, the humerus. Alternative intraosseous needle insertion site: ilium. Helm M, Breschinski W, Lampl L, et al. [Intraosseous puncture in preclinical emergency medicine. Experiences of an air rescue service]. Anaesthesist. 1996 Dec. 45(12):1196-202. [Medline]. Josefson A. A new method of treatment--intraosseous injections. Acta Med Scand. 1934. 81:550. 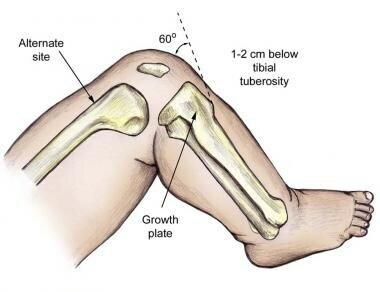 Arbeiter HI, Greengard J. Tibial bone marrow infusion in infants. J Pediatr. 1944. 25:1. Elston JT, Jayne RV, Kaump DH, et al. Intraosseous infusions in infants. Am J Clin Pathol. 1947. 17:143. Heinild S, Sondergaard T, Tudvad F. Bone marrow infusion in childhood: Experiences from a thousand infusions. J Pediatr. 1947. 30:400. Tocantins LM. Rapid absorption of substances injected into the bone marrow. Proc Soc Exp Biol Med. 1940. 45:292. Tocantins LM, O'Neil JF. Infusions of blood and other fluids into the general circulation via the bone marrow. Surg Gynecol Obstet. 1941. 73:281. Tocantins LM, O'Neil JF, Jones HW. Infusions of blood and other fluids via the bone marrow. JAMA. 1941. 117:1229. Tocantins LM, O'Neil JF. Complications of intraosseous therapy. Ann Surg. 1945. 122:266. Berg RA. Emergency infusion of catecholamines into bone marrow. Am J Dis Child. 1984 Sep. 138(9):810-1. [Medline]. Brunette DD, Fischer R. Intravascular access in pediatric cardiac arrest. Am J Emerg Med. 1988 Nov. 6(6):577-9. [Medline]. Carlson JN, Gannon E, Mann NC, et al. Pediatric Out-of-Hospital Critical Procedures in the United States. Pediatr Crit Care Med. 2015 Oct. 16 (8):e260-7. [Medline]. Abe KK, Blum GT, Yamamoto LG. Intraosseous is faster and easier than umbilical venous catheterization in newborn emergency vascular access models. Am J Emerg Med. 2000 Mar. 18(2):126-9. [Medline]. Beekley AC, Starnes BW, Sebesta JA. Lessons learned from modern military surgery. Surg Clin North Am. 2007 Feb. 87(1):157-84, vii. [Medline]. de Caen AR, Reis A, Bhutta A. Vascular access and drug therapy in pediatric resuscitation. Pediatr Clin North Am. 2008 Aug. 55(4):909-27, x. [Medline]. Brierley J, Carcillo JA, Choong K, Cornell T, Decaen A, Deymann A, et al. Clinical practice parameters for hemodynamic support of pediatric and neonatal septic shock: 2007 update from the American College of Critical Care Medicine. Crit Care Med. 2009 Feb. 37(2):666-88. [Medline]. Kissoon N, Orr RA, Carcillo JA. Updated American College of Critical Care Medicine--pediatric advanced life support guidelines for management of pediatric and neonatal septic shock: relevance to the emergency care clinician. Pediatr Emerg Care. 2010 Nov. 26(11):867-9. [Medline]. Banerjee S, Singhi SC, Singh S, Singh M. The intraosseous route is a suitable alternative to intravenous route for fluid resuscitation in severely dehydrated children. Indian Pediatr. 1994 Dec. 31(12):1511-20. [Medline]. Horton MA, Beamer C. Powered intraosseous insertion provides safe and effective vascular access for pediatric emergency patients. Pediatr Emerg Care. 2008 Jun. 24(6):347-50. [Medline]. Von Hoff DD, Kuhn JG, Burris HA 3rd, Miller LJ. Does intraosseous equal intravenous? A pharmacokinetic study. Am J Emerg Med. 2008 Jan. 26(1):31-8. [Medline]. Engle WA. Intraosseous access for administration of medications in neonates. Clin Perinatol. 2006 Mar. 33(1):161-8, ix. [Medline]. Kissoon N, Rosenberg H, Gloor J, Vidal R. Comparison of the acid-base status of blood obtained from intraosseous and central venous sites during steady- and low-flow states. Crit Care Med. 1993 Nov. 21(11):1765-9. [Medline]. Joseph G, Tobias JD. The use of intraosseous infusions in the operating room. J Clin Anesth. 2008 Sep. 20(6):469-73. [Medline]. Myers LA, Russi CS, Arteaga GM. 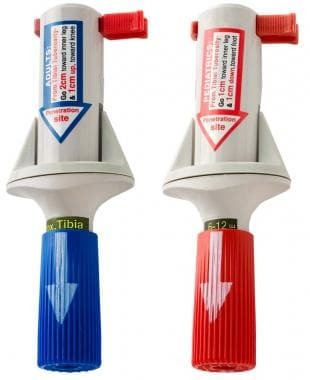 Semiautomatic intraosseous devices in pediatric prehospital care. Prehosp Emerg Care. 2011 Oct-Dec. 15(4):473-6. [Medline]. Clem M, Tierney P. Intraosseous infusions via the calcaneus. Resuscitation. 2004 Jul. 62(1):107-12. [Medline]. McCarthy G, O'Donnell C, O'Brien M. Successful intraosseous infusion in the critically ill patient does not require a medullary cavity. Resuscitation. 2003 Feb. 56(2):183-6. [Medline]. Zabala Arguelles JI, Maranon Pardillo R, Gonzalez Serrano P, Serina Ramirez C. [Main vascular access in situations of extreme urgency: intra-osseous infusion]. An Esp Pediatr. 1992 Dec. 37(6):489-92. [Medline]. 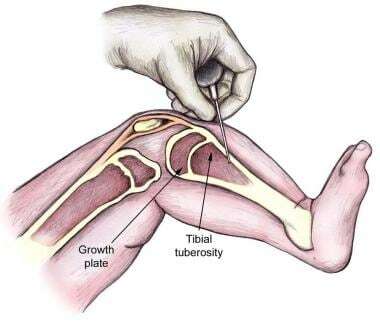 Brickman KR, Rega P, Koltz M, Guinness M. Analysis of growth plate abnormalities following intraosseous infusion through the proximal tibial epiphysis in pigs. Ann Emerg Med. 1988 Feb. 17(2):121-3. [Medline].